Maeve is a native of Ballinamore in County Leitrim and she joined Connellans Solicitors in October 2017. Maeve trained as a Solicitor in the banking and commercial department of Noel Smyth & Partners Solicitors, a large mid-tier firm in Dublin 2. 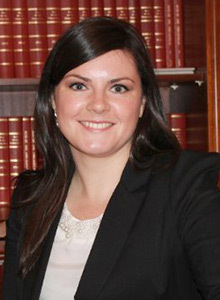 After qualification, Maeve joined McCann Fitzgerald Solicitors, Dublin and thereafter worked with J.D. Scanlon & Company Solicitors, Tullamore for a number of years, before joining Connellan Solicitors. Maeve has experience in all areas of general practice, but her areas of specialty include Business and Commercial Law, Property Law, Secured Lending, Wills & Administration of Estates, Licensing Law and Personal Injuries Law. Under-graduate Bachelor of Corporate Law degree (International) (honours). Post-graduate Bachelor of Laws degree (LLB) (honours). Graduate of National University of Ireland, Galway (NUIG). Diploma in French Law from Universite d’Auvergne, Clermont Ferrand, France. Admitted as a Solicitor in Ireland and qualified in England and Wales. Post-qualification Law Society Diploma in English and Welsh Property Law. Member of the Law Society of Ireland. Member of the Midland Bar Association. Outside of the law, Maeve is a member of SVP, has acted as vice-Chair in an inner-city Dublin area, as well as volunteering with FLAC and participates in mentoring of university law students.